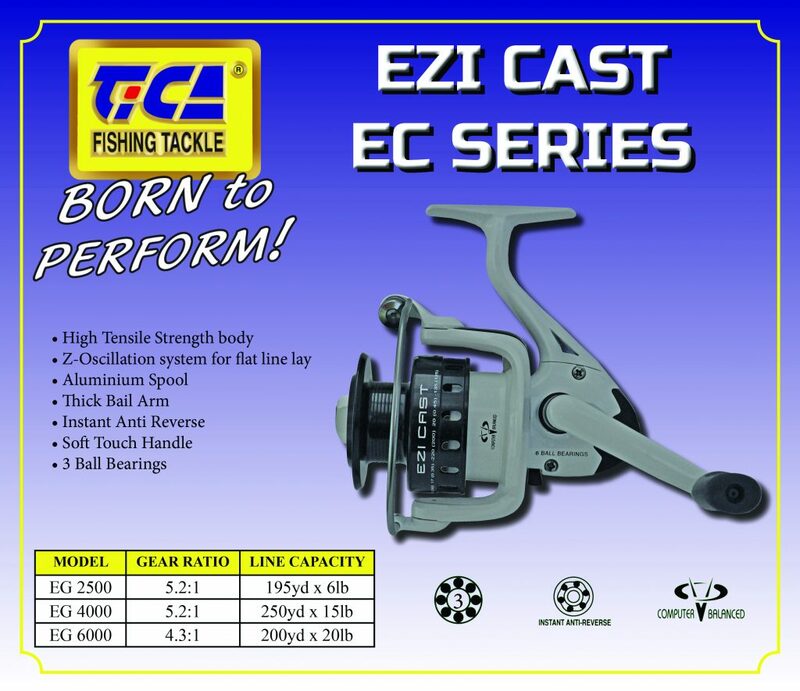 The new TiCA Ezi Cast reels offer an exceptional entry reel packed full of quality features. They come in a vibrant white finish with a Black Aluminium spool and black cover plates. To view more on the TiCA range simply click on the TiCA LOGO on this website. Strike Pro Astro Vibe 45 Hot New Colours! 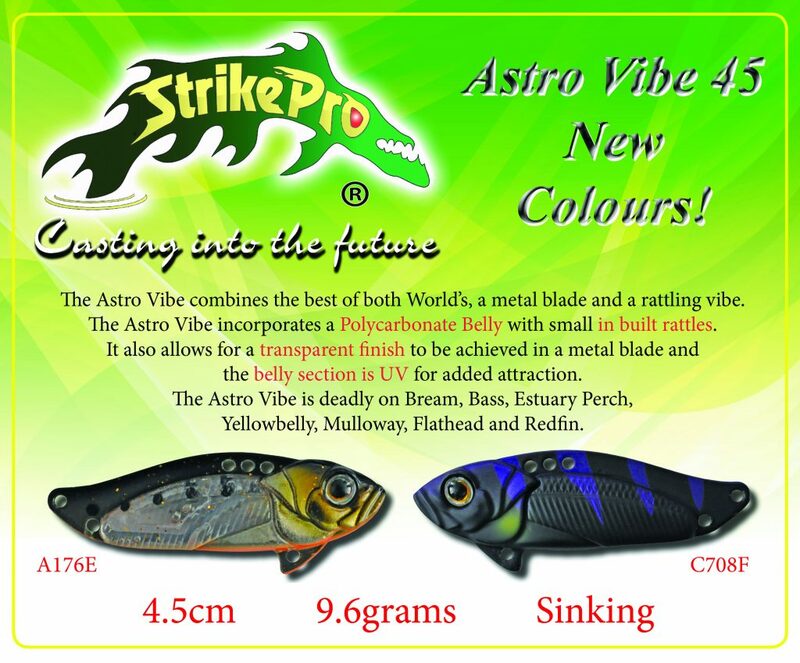 We have released 2 outstanding new colours in the highly popular and very effective range of Strike Pro Astro Vibe 45 lures. The new colours are sure to be a huge hit and feature the unique Polycarbonate belly UV reactive belly with In-Built rattles like the rest of the Astro Vibe range. To find out more, simply click on the Strike Pro Logo on the Homepage. We are pleased to announce that we have released many new products into the Eureka Hunting range for Season 2018. There are new releases in Hunting Knives, Folding Knives, Fishing Knives, Multi Tools & Sharpeners. 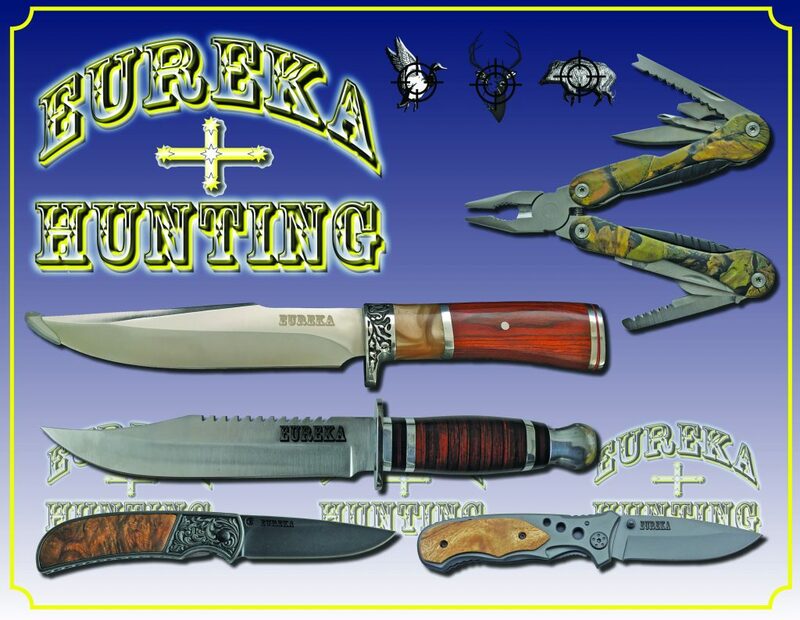 To look at the latest releases simply click on the the Eureka Hunting Logo on the Homepage. 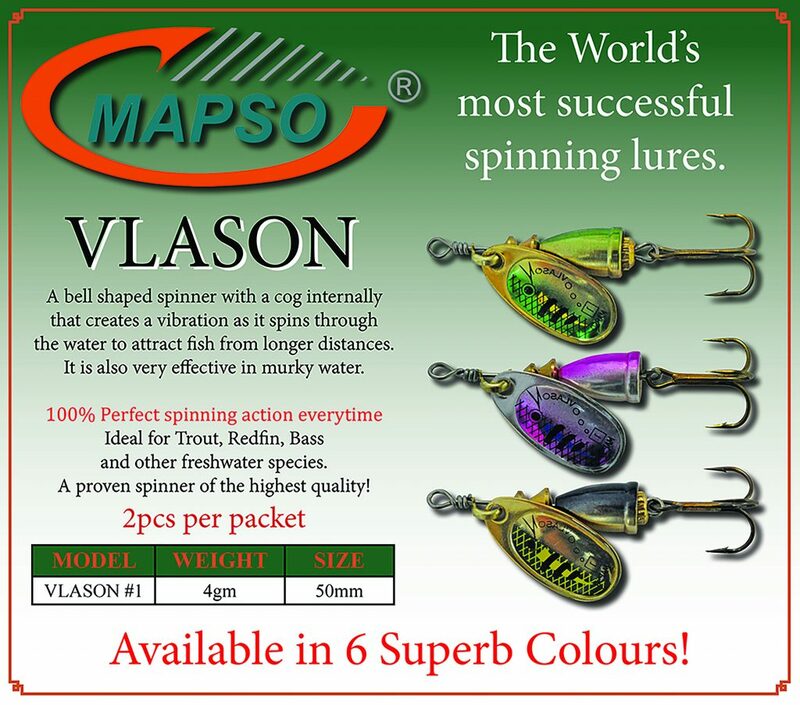 The new Mapso Vlason spinners are a bell shaped lure that features a cog internally that creates a vibration as it spins through the water to attract fish from a further distance and is also effective in murky water. 100% Perfect spinning action everytime. Click on the Mapso logo on the Homepage to find out more on the superb range of Mapso Spinners. The new Eureka Octane Jigs are an amazing exquisite Squid / Octopus imitation designed for slow pitched jigging that have exceptional realism and a tantalizing action! 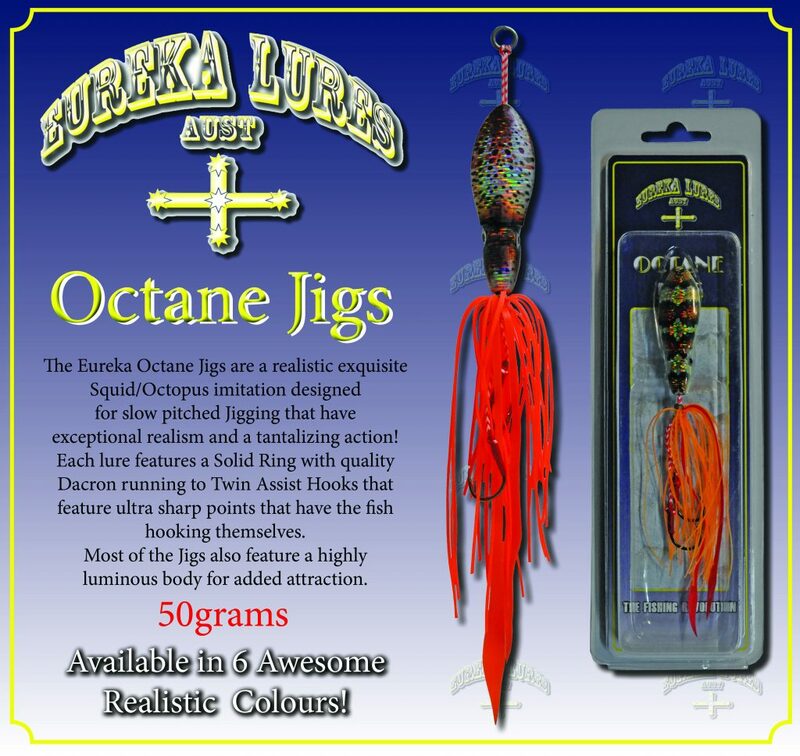 To find out more on the Eureka Octane Jigs, click on the Eureka Lures Logo. We have just received the latest offering from Eureka Lures. The 3D Baitfish are a truly outstanding Baitfish profile lure that offer an extraordinary realistic finish. The Eureka 3D Baitfish lures come rigged with a quality single hook and can be either cast retrieved or used as a Micro Jig. 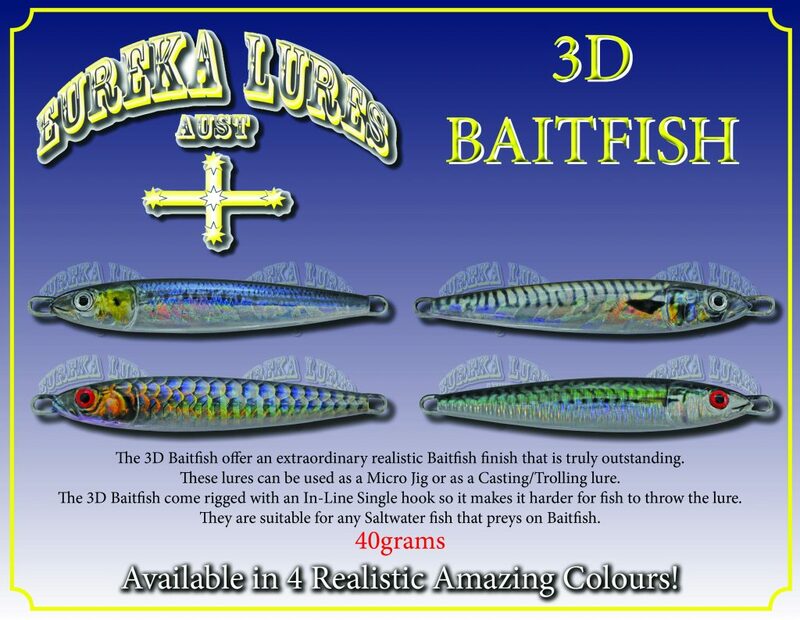 To find out more on the Eureka 3D Baitfish range, click on the Eureka Lure Logo on the Homepage.